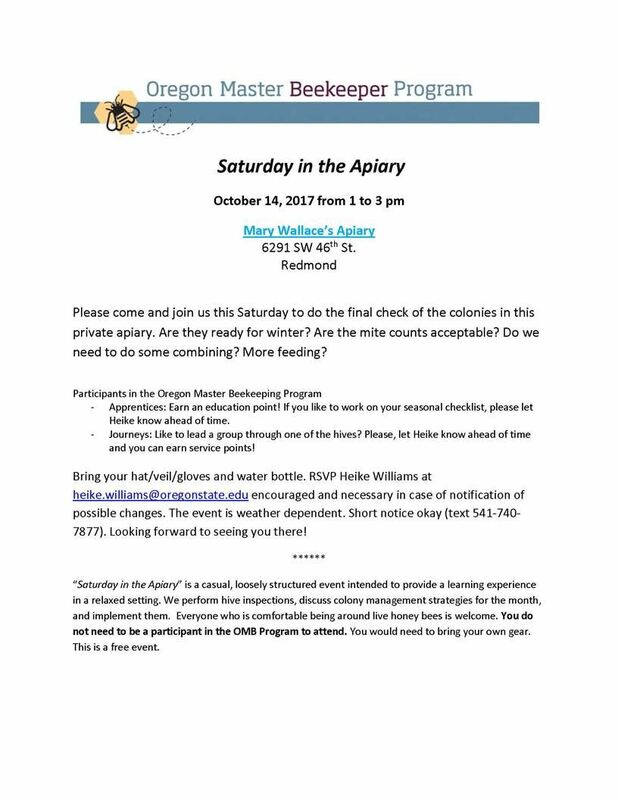 Central Oregon Beekeeping Association - COARC Saturday in the Apiary - NEW LOCATION!! COARC Saturday in the Apiary - NEW LOCATION!! The location to the workshop tomorrow is changing to the apiary at the Central Oregon Ag Research Center (see address below). My apologies for those of you who have to drive a longer distance than anticipated. It will be in the low to mid 50s. I will use the opportunity to demonstrate how you can do a quick check of your hives in chilly weather. Same time: 1 to 3 pm. Still hope to see you tomorrow! I will have some coffee brewing! Bring your hat/veil/gloves and water bottle. RSVP Heike Williams at heike.williams@oregonstate.edu for details and notification of possible changes. Short notice okay (text her at 541-740-7877). This event is weather dependent. Looking forward to seeing you there! “Saturday in the Apiary” is an opportunity to gather at the OSU’s apiary at the Central Oregon Ag Research Center in Madras, or, like this time, at a private apiary. We perform hive inspections, discuss colony management strategies for the month, and implement them. It is a great opportunity for hands-on experience, plus to get to know other beekeepers in the OMB program and in the region. Everyone who is comfortable being around live honey bees is welcome. You do not need to be a participant in the OMB Program to attend. You would need to bring your own gear. This is a free event.